Gumption: Blessed Unrest: Environmental and Social Justice for All … or Bust! 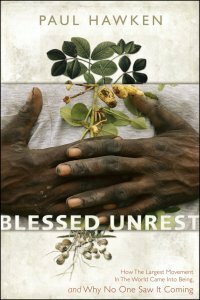 Blessed Unrest: Environmental and Social Justice for All … or Bust! In his latest book (and video), environmentalist, entrepreneur, journalist, and author Paul Hawken achieves a remarkable balance between breadth and depth in arguing that in order to restore environmental and social balance on this earth, we must strive for both, or we will achieve neither. Noting that "we are nature", and thus however we treat the earth affects its people and however we treat one another affects the earth, Hawken presents a systems approach in which recognizing our interrelatedness, taking advantage of our interconnectedness, and acting with greater consciousness may allow us to save ourselves and our planet from the brink of disaster. The title of the book, Blessed Unrest: How the Largest Movement in the World Came into Being and Why No One Saw It Coming, is based on Hawken’s estimate of somewhere between one to two million organizations worldwide – many of them very small and narrowly focused (hence their relative unremarkability, from the point of view of major media) – that are acting to improve environmental and/or social conditions. Although many of these organizations (some of which are listed at WiserEarth.org) are acting independently, an increasing number are linking together with other organizations – in the non-profit, government and commercial sectors – to achieve greater progress ... think globally, act locally, link laterally. The Unrest in the title presumably describes the motivations of people in this Movement – what moves them to take risks in challenging commercial rights on behalf of the rights of the planet and its peoples. I was deeply moved by the book – it is searingly provocative on an intellectual and emotional level. I’m not sure how much risk I’m willing to take on in order to join this movement … but I’ll at least write about it (Hawken notes that the key attributes to success in fighting for environmental and social justice are "gumption and persistence", so this is at least within scope for [the name of] this blog), and perhaps writing will help pave the way toward further action, by me and/or others (socio-neuro-linguistic programming?). I found myself feeling physically ill during some passages, such as when he described a single day in the 15th century during which Spanish conquerors raped and beheaded 3,000 people in front of a [presumably complacent, if not condoning] priest. Other passages moved me to tears of sadness, as when he recounted the desecration of The Mother of the Forest, a 363-foot sequoia cut down and transported to New York to parade in front of audiences in the mid-nineteenth century, or the horrendous mistreatment of children by industrialists in England during the latter part of that century, such as the teenaged girls typically employed as benchgrinders who lost the ability to sleep, to stand, and eventually, to breathe, often dying before reaching adulthood. Hawken highlights the history of economic fundamentalism – in which commercial rights have consistenly trumped human (and environmental) rights – perhaps most starkly exemplified by the Frame Breaking Act of 1812 in England, whereby people who destroyed machinery could be executed, while corporations running machinery that destroyed people were unaccountable. This primacy of business interests over environmental and social interests extends back through thousands of years of slavery and indentured servitude, and is still very much alive and well today, as exemplified by the “rights” of the World Trade Organization, which imposes sanctions on countries that seek to impose restrictions on commerce due to the environmental and/or human costs incurred in the production of "goods". In fact, I believe that it is the nearly unfettered ability of corporations to externalize such costs – to exclude them from any financial accounting, and thereby excuse themselves from any moral or civic accountability – that has led us to the brink of planetary and humanitarian catastrophe. If everything and everyone is truly connected – an "Ecology 101" perspective that Hawken argues for repeatedly and convincingly throughout the book – then there are no externalities, and the sooner we (and I use the term with intentional ambiguity) adopt accounting and accountability systems with greater integrity, the better … and if we wait too long, we may give new, planetarily posthumous meaning to the cliché "he who dies with the most toys, wins". Any kind of fundamentalism is dangerous, and, I believe, ultimately disastrous (I'm reminded of the slogan "all isms lead to schisms"). All fundamentalists are, consciously or unconsciously, promoting totalitarianism, and so all fundamentalist movements represent pathologies of power. The world would be a better place if everyone were a Muslim / Christian / capitalist / communist / etc., and so any means of shifting the balance in the “right” direction – through "expirtation, genocide and colonialism … cultural cleansing for the supposed benefit of the victim" – are justified. James Carse's observation that "all evil is the result of trying to eliminate evil" (e.g., "the only good Indian is a dead Indian") - and, for those more familiar with his insights into finite and infinite games, "evil is not the inclusion of finite games in an infinite game, but the restriction of all play to one or another finite game" - offers an interesting perspective on the fundamentalist perspective. Man is a credulous animal and must believe in something. In the absence of good grounds for belief, he will believe in bad ones. Richard Dawkins’ book, The God Delusion, offers further insights into these fundamental human tendencies as they apply to the religious dimension. Hawken’s recounting of the attacks on Rachel Carlson, author of Silent Spring, a 1962 expose on the harmful effects of the chlorinated pesticides (DDT), highlight a relatively newer, secular dimension for bad grounds for belief, also known as corporate junk science, in which corporate funded "think tanks" sow seeds of fear, uncertainty and doubt about any scientific discoveries that may harm their economic bottom line. This tactic of assimilation through dissimulation is promoted implicitly and explicitly by corporations, governments and their partners and co-beneficiaries, the mainstream media, more recently exemplified by reactions – or lack thereof – to threats of climate change and Weapons of Mass Destruction Delusion … though, as Hawken observes, “any finger-pointing is inevitably directed back to ourselves" (reminiscent of my own recent revelations regarding seeing what I want to see). Hawken notes that fundamentalism is, fundamentally, about ideology, and any fundamentalism – whether it is capitalism, socialism, capitalism or terrorism – is based on uniformity rather than diversity, and thus more inclined to justify and dictate than to question and liberate. Diversity, along with self-organization and self-regulation, are among the hallmarks of an effective immune system (or what Fritjof Capra, in his book, The Web of Life, calls an immune network), and Hawken suggests that "the widely diverse network of organizations proliferating in the world today may be a better defense against injustice than F-16 fighter jets". Although much of the focus in the book is on how small organizations are working to improve the lots of the planet and its peoples, Hawken also includes some larger scale initiatives, such as The Nature Conservancy, which has US$4.4B in assets, the Clinton Global Initiative, which recently raised US$7.3B in pledges to combat global warming, injustice, intolerance and poverty, and the Gates Foundation, with US$29B in assets (and an annual budget that is twice that of the World Health Organization), dedicated to the eradication of disease in the developing world. While I hope these initiatives are successful, I have to note that I think it’s ironic that Bill Clinton, who, despite his purported commitment - in the past and present - to environmental and social causes, was an ardent proponent of some of the foremost tools of promulgating environmental and social injustice, through his support for NAFTA, GATT and welfare reform (and even his former Labor Secretary, Robert Reich, who I had previously thought was more populist than corporatist, has recently been defending the gross inequity of the gross pay given to many CEOs). We cannot save our planet unless humankind undergoes a widespread spiritual and religious awakening … What if there is already in place a large-scale spiritual awakening and we are simply not recognizing it? As is often the case (with me), this positive feeling was soon followed by some self-critical reflection (perhaps because I was reading the book on an international flight during which, according to Atmosfair, I was personally responsible for the emissions of approximately 3270 kg of C02 into the atmosphere): we I may be experiencing a spiritual awakening, but what are we am I doing about it? One day you finally knew what you had to do, and began, though the voices around you kept shouting their bad advice. So what am I going to do? How much gumption do I really have? Is the work I do really serving to promote environmental and social justice? Is it having impact on a scale that is commensurate with my abilities? [By definition, I suppose, it’s having impact on a scale that is commensurate with my willingness.] Can I really help to empower people to achieve greater environmental and social justice in my role(s) at Nokia? I’m not sure about the “blessed” dimension, but Hawken’s book has clearly created some unrest in me. While I have written about environmental and social issues in the past, I believe I can do more to take part in this movement … and I am taking small steps in that direction. Although not directly related to the main focus of my research, I will be participating in a session at Pop!Tech 2007 in which I will be joined by Katrin Verclas and Nathan Eagle in giving presentations and leading discussions about broad visions and specific examples of how mobile technologies are serving to empower people throughout the developing world to develop solutions to the local environmental, social and political challenges they face. It’s a small step (for me, especially when compared to the steps taken by my cohorts in the session), but it does lie along a trajectory that seems to increasingly beckon me, including my recent awakening to the enormous challenges in Africa, and my recent exposure to the ways that communities and technologies can be used to address those challenges. I can’t say that a clear path has emerged for how I can (or will) do more yet, but as long as I keep taking even small steps in the right direction, I believe I am contributing in positive ways to this movement.